Is he more important as a foil for Romney? Nothing would make me happier than for Our Genial Host to better his May 2005 50/1 bet on Barack Obama to become the next POTUS by seeing Jon Huntsman win him the 200/1 bet made in November 2008. I still don’t think it likely – the Republican Party has not yet served its ‘Time in the Wilderness’ and been brought back round to the hungry pragmatism that oppositions need to generate in order to overthrow non-vulnerable incumbents. I would consider the GOP to be in a similar position to the Tories at the end of Iain Duncan-Smith’s tenure – not as inclined to pitch exclusively to their base (Hague’s â€œ9 days to defend the poundâ€, the 2006 midterm Tea Party campaign), but not yet resolved to unite around a strong pragmatic compromise candidate who can lose with dignity (Kinnock 1992, Howard 2005) and prepare the ground for the sort of centrist who can modernise the party and win (Blair, Cameron, Jon Huntsman/Mitch Daniels/Chris Christie). So why does Huntsman’s candidacy matter? I think it’s biggest impact will be to help Mitt Romney in his quest to seal the nomination. Romney had, I thought, a very strong campaign in 2008 – whilst he narrowly lost in total delegates to Huckabee, he did well to come in the top 2 in almost all of the early states: from Iowa and New Hampshire, to Michigan, to Nevada, and Florida. Accusations of plasticity aside, Romney was the â€œConservative for All Time Zonesâ€ and I don’t think that’s so different this time around either. He has an inbuilt advantage – most of the rational sane candidates are sitting out 2012, and with Obama likely to be unchallenged in the Democratic primaries, plenty of Independent voters will exercise their votes in the Republican primaries. The money, the name recognition, and the weakness of the field could well conspire to give him the nomination. Romney’s greatest personal weaknesses are far from insurmountable, although they often rely on favourable comparison to be ameliorated. His boringness pales into insignificance with the unbearable blandness of Tim Pawlenty. His slightly artificial look is easily trumped (if you’ll pardon the pun) by Rick Perry’s hair. Which leaves his Mormonism. Make no mistake – there is real hostility to Mormonism as a creed in much of the Religious Right. Many do not consider it Christianity at all, and the strength and importance of the Southern Baptist Council and their ilk are not to be taken lightly. It could be made to work in Romney’s favour – like Herman Cain, he gives the GOP the opportunity to demonstrate that it is capable of overcoming its prejudices – but it needs a process of normalisation that Romney will not only want to avoid, but is (as a Bostonian son of the former Governor of Michigan) not perfectly equipped to do. The process of normalising Mormonism in Republican politics would better fall to a candidate whose Mormonism is intrinsic to his previous political appeal – perhaps a popular, two-time Republican Governor of that most-Mormon of states, Utah? 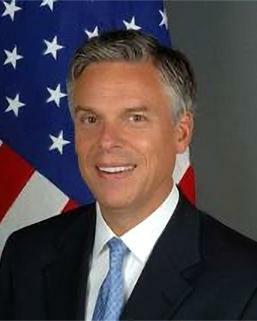 Huntsman has the chance to affect the primaries in two key ways. His general civility makes it harder for the more extreme personalities to turn in apocalyptic performances – Bachmann, Palin, Perry are all capable of going off the deep end, but they tend not to do so if in debate with more moderate performers: Palin’s best public performance to date was her measured and civilised debate against the then-Senator Joe Biden in 2008. But beyond civility, Huntsman helps normalise the notion of a Mormon candidate for President. Having one Mormon in the race will attract hostility, or at least questions as to the severity of the handicap. It is harder for the media to write off a third of the viable field for such a handicap, and the issue becomes less toxic for them both. Romney still has much to overcome, not least his accidental grand-paternity of Obamacare and his transparent, even naked, flip-flopping on social issues such as abortion. But having Huntsman in the race gives him the flexibility to take on a field protected from their tendency towards rampant incivility, and also stops Romney from being â€œthe Mormon candidateâ€. Jon Huntsman does have a (very slim) chance of the GOP nomination, and is probably the one Republican capable of beating Obama in 2012. But whether or not he gets that chance, and whether or not his eyes are geared towards a head-start on the Rubios, Christies, Daniels and Cantors in 2016, he can still have an impact on this race. He can do what no other candidate can do, and make Mitt Romney seem normal.